Sensitive skin can be tricky. If your skin falls into that category, you know what a challenge it is to find skincare products that address this concern plus others many of us have, from breakouts to wrinkles. 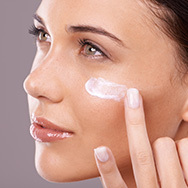 Is it possible to find a moisturizer that delivers the skin-beneficial ingredients you want while still coddling sensitive skin? Thankfully, it is. The team at Paula’s Choice Skincare knows the struggles of having sensitive skin, and has studied the research on the causes and solutions of sensitive skin. We kept in mind everything we learned from the research when we created our CALM Redness Relief Collection. Because sensitivity can affect more than just one skin type, we have solutions, whether your skin is oily or dry. Every CALM product delivers anti-aging ingredients while being gentle enough even for skin prone to rosacea. CALM Redness Relief Moisturizer for Normal to Dry Skin is a rich cream with a radiant finish that delivers deep hydration along with ingredients designed to fight the signs of aging and, of course, ease redness and sensitivity. CALM Redness Relief SPF 30 Mineral Moisturizer for Normal to Dry Skin defends skin from the harsh rays of the sun with a creamy, cushiony formula that nourishes skin and diminishes the appearance of redness. Its gentle mineral sunscreens are a custom-fit for sensitive skin. CALM Redness Relief Moisturizer for Normal to Oily Skin hydrates skin with a lightweight, non-greasy formula featuring skin-soothing ingredients like licorice root extract and beta-glucan. CALM Redness Relief SPF 30 Mineral Moisturizer for Normal to Oily Skin leaves skin with a soft matte finish, while protecting it with gentle mineral sunscreen actives that won’t aggravate skin. Antioxidants provide an extra measure of environmental defense and do double duty because they soothe skin, too.